Interventional cardiology has not only been at the forefront of innovating technology and techniques but is also the subspecialty with the fastest dissemination of technology and techniques across the globe, facilitated by a powerful infrastructure of peer-to-peer learning. Twenty-two years ago, when I first worked in a cath lab, no one imagined that we would be replacing valves through catheters. Bare-metal stents were sparingly available and perfusion balloons were the rescue option for dissection caused by angioplasty. When performing any angioplasty procedure, cardiothoracic surgeons were required to be on standby. In those days, at least one groin bleed kept me up each on-call night. Now, we can do multivessel intervention through radial access and send the patient home in 6 hours! This evolution has been possible because of the continuous longing to make patient care better. I was fortunate to learn the transradial access (TRA) approach in 1999 from one of the pioneers, Dr. Tejas Patel. It was not about the operator, the anatomy made sense. It was very exciting and truly seemed to be a minimally invasive, patient-friendly, cost-saving, and safer approach for doing cardiovascular procedures. At first, the data to support the TRA approach were lacking, but the worldwide radialist fraternity worked tirelessly to generate high-quality data without much commercial support. Now, we know that TRA not only improves vascular complication rates but saves lives and improves patient comfort while saving health care dollars.1,2 Despite these benefits, TRA is still limited by complications including spasm, pain, access crossover, radial artery occlusion (RAO), and the inability to use large-bore guide catheters. We have learned from the histopathology evaluation11 and optical coherence tomographic evaluation12 that the RA suffers more trauma by sheaths in the distal RA than by the catheter in the proximal RA. This is purely explained by the larger S-A ratio in comparison to the C-A ratio. For the same reason, the majority of patients do not tolerate 7-F sheaths and the inability to use a large-bore guide catheter is one of the main reasons for going to femoral access for many operators. During the RIVAL trial,11 highly experienced radial operators used 7-F catheters in 6% of transfemoral (TF) cases but only in 1% of TRA cases, clearly suggesting that given a choice, they would use 7-F guide catheters in an additional 5% of their cases. Figure 1. ODs of various 6-F sheaths and 6-F guide catheter with Railway™. 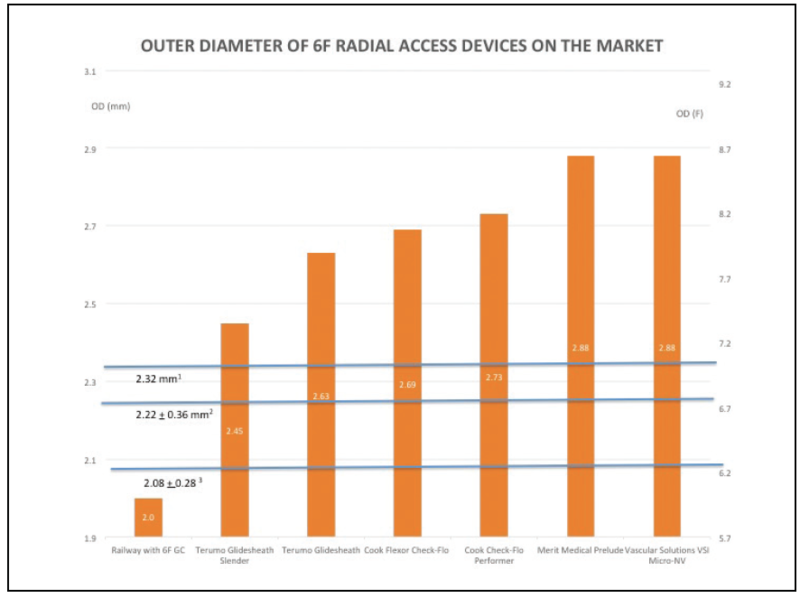 The mean diameter of the RA (2.32 mm,13 2.22 mm,14 2.08 mm15) in three different studies, suggesting that the majority of RAs are smaller than a 6-F sheath and larger than a 6-F Railway™ guide catheter. I envisioned being able to access the RA with a universal 5-F (virtual 3-F, ~1.67-mm hole) or 6-F (virtual 4-F ~2-mm) guide catheter using Railway™ to perform coronary angiography, physiologic evaluation, or simple PCI if the universal guide support is adequate. This way, I could complete at least 50% of my coronary procedures with a virtual 3- or 4-F hole and a guide catheter. Railway™ will allow easy exchange for any supportive-shaped guide or larger (6 or 7 F) guide catheter over a 0.035-inch wire. Thus, only using virtual 4- or 5-F hole in the RA, one could perform most complex interventions. For planned or staged interventions, Railway™ would be an even more attractive option, as it will allow the use of any shape guide catheter with 2-F smaller accesses. As seen in Figure 1, using Railway™ would allow the C-A ratio of < 1. The smaller puncture should potentially allow shorter hemostasis time. The smooth transition from wire to Railway™ dilator to catheter, as well as the flexible, tapered, hydrophilic tip of Railway™ make it a very good tracking device to navigate the guide catheter through tortuous upper limb arterial anatomy. Railway™ is a versatile device and could be used in many ways to fit the operator’s preference and provide a simple solution for the limitation of TRA. Can we reduce the S-A ratio to < 1 for each TRA by using Railway™ and direct catheter access? Would that translate to reduced trauma, spasm, pain, access crossover, and RAO? Although I believe it would, the ever-enthusiastic radial fraternity will investigate that objectively. The extensive experience with TRA and the introduction of the Railway™ device should allow the interventional community to further advance the radial approach by eliminating some of the current limitations. An 87-year-old woman presented with acute onset of shortness of breath that woke her up at 12:00 AM. She was admitted through the emergency department for acute exacerbation of congestive heart failure (CHF). Prior to this admission, she was admitted to our hospital with acute CHF 3 weeks earlier, during which time, she underwent thorough examination. She was diagnosed with CHF, non–ST-segment elevation myocardial infarction, new-onset atrial fibrillation, severe aortic stenosis, and severe triple-vessel coronary artery stenosis. Her other past medical history included hypertension, dyslipidemia, and remote history of smoking. Electrocardiography at the time of previous admission showed atrial fibrillation, incomplete left bundle branch block, and repolarization changes. Her troponin level was 1.3 ng/mL. At this time, echocardiography showed a heavily calcified aortic valve with restricted movement of the leaflets. The peak velocity measured across the aortic valve was 3.9 m/s, mean gradient was 36 mm Hg, the dimensionless index was 0.28, and calculated aortic valve area was 0.97 cm2. There was moderate concentric left ventricular hypertrophy and normal systolic function with a left ventricular ejection fraction of 55% to 60%. She was further investigated with coronary angiography and was found to have severe three-vessel disease. The patient was evaluated by a surgical team during her last admission. Her Society of Thoracic Surgeons risk score was calculated at 4.8. She was offered the treatment option of multivessel percutaneous coronary intervention (PCI) followed by transcatheter aortic valve replacement (TAVR). She was uncertain if she wanted to pursue the treatment and was discharged after adequate control of her ventricular rate with a ß-blocker and was anticoagulated with apixaban and aspirin along with other medical management. Within 12 hours of admission through the emergency department, she had an episode of acute chest pain with rapid ventricular rate and ST depression in the inferolateral leads. This time, along with family, the patient opted for treatment. Her creatinine was 0.8 mg/dL and estimated glomerular filtration rate was 49 mL/min. Despite anticoagulation, it was determined that the patient should undergo urgent high-risk PCI. Because the last dose of apixaban was given < 24 hours prior and the patient had a high TIMI (thrombolysis in myocardial infarction) bleeding risk score, TF access was considered high risk, and PCI was planned through TRA. With her short stature, obesity, and age (87 years), we anticipated difficulties during TRA. It was decided not to use any support device unless the patient became hemodynamically unstable to avoid the risk of bleeding. Figure 2. A 6-F, 0.018-inch Railway™ dilator is preloaded with a guide catheter, and direct guide catheter access is obtained over a 0.018-inch access wire in the RA (A). An example of a guide catheter in the distal RA after direct catheter access, and an intra-arterial vasodilator cocktail is injected using the manifold (B). Using a 6-F Railway™ sheathless access system and a 6-F Judkins right (JR) 4 Launcher® guide (Medtronic), the right TRA was obtained (Figure 2A). After getting direct guide catheter access in the RA, the Railway™ dilator was removed and the catheter was connected to the manifold using a Y-connector. Vasodilator cocktail (nitroglycerin 100 mcg + verapamil 2.5 mg) was injected through the manifold (Figure 2B). RA angiography was performed because of difficulty in advancing a 0.035-inch J wire, which showed severe tortuosity in the RA originating from the axillary artery (Figure 3A). A 0.018-inch V-18™ ControlWire™ (Boston Scientific Corporation) was advanced through the tortuosity(Figure 3B). A JR 4 guide catheter was advanced using a 0.018-inch Railway™ dilator without any resistance (Figure 3C) under direct fluoroscopic guidance to the right subclavian artery. The 0.018-inch wire and Railway™ dilator were removed. The JR 4 guide was cannulated in the right coronary artery (RCA). The mid-RCA subtotal occlusion (Figure 4A) was treated with a 1.5- X 20-mm balloon, followed by 3- X 15-mm and 3- X 15-mm Cobra PzF™ stents (CeloNova BioSciences, Inc.) to treat the 95% to 99% stenosis in the mid-RCA and 70% stenosis in the mid/distal RCA, respectively, with a very good final angiographic result (Figure 4B). Figure 3. RA angiography showing severe tortuosity and an anomalous high origin (A). A 0.018-inch wire is steered through the tortuosity (B). A JR 4 guide catheter is being advanced along with the Railway™ dilator over a 0.018-inch wire (C). Figure 4. 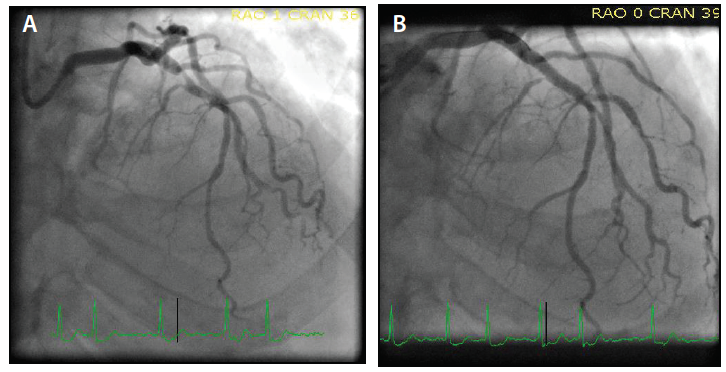 A severe mid-RCA subtotal occlusion (A) and the final angiographic result of the RCA intervention (B). Figure 5. A 6-F guide catheter preloaded with the 0.035-inch Railway™ dilator aligned at the 100-cm marker (A). The assembly of the Railway™ dilator and EBU guide catheter being inserted over a 0.035-inch wire (B). Figure 6. A severe obtuse marginal stenosis (A) and the postinterventional angiographic result (B). Figure 7. A severe LAD stenosis (A) and the postinterventional angiographic result (B). An extra backup (EBU) 3.5 Launcher® guide catheter (Medtronic) was preloaded with the 0.035-inch Railway™ dilator (Figure 5A) to match the 100-cm marker. The JR 4 guide catheter was pulled back over a 0.035-inch J wire secured in the ascending aorta. The assembly of the Railway™ dilator and EBU guide catheter was inserted (Figure 5B) up the right brachiocephalic artery. The dilator was removed, and using a 0.035-inch wire and standard practices, the left main artery was cannulated. The first obtuse marginal artery 90% stenosis (Figure 6A) was successfully treated with the same 1.5-mm balloon and a 2.75- X 15-mm Cobra PzF™ stent, with a very good angiographic result (Figure 6B). 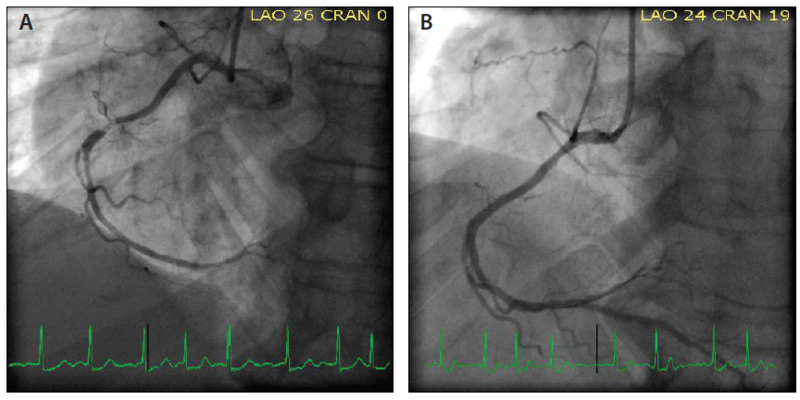 Subsequently, the left anterior descending (LAD) lesion (Figure 7A) was successfully treated using a 3.5- X 15-mm Cobra PzF™ stent, which was postdilated with a 4-mm noncompliant balloon showing a very good angiographic result (Figure 7B). After completing final orthogonal angiography, the guide catheter was removed over a 0.035-inch wire to the right RA and a TRAcelet™ compression device (Medtronic) (Figure 8A) was applied. The patient’s postprocedure course was unremarkable, and she was discharged home the next morning with aspirin 81 mg, clopidogrel 75 mg, and apixaban 2.5 mg twice daily. Right RA patency was confirmed with the reverse Barbeau test. The patient was seen 1 week after the index procedure for pre-TAVR workup and did not complain of chest or wrist pain. Figure 8. A radial compression device is applied prior to removing the guide catheter (A). The OD of a 6-F guide with the Railway™ sheathless access system is 2 F smaller in comparison to a traditional 6-F sheath and 1.5 F smaller in comparison to a 6-F slender sheath (B). 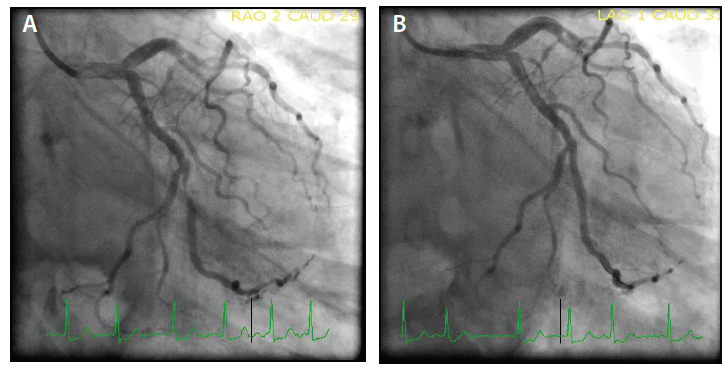 Post-PCI imaging showing no bleeding around a 7-F guide catheter used for direct catheter access despite anticoagulation and manipulations (C). The majority of limitations of the TRA approach are related to the anatomy and physiology of the RA. Smaller size, severe tortuosity, and variation in anatomy are common in elderly female patients. Spasm, pain during sheath insertion and removal, as well as access crossover are common in these subset of patients during TRA. Elderly female patients are also at the highest risk of femoral access-related complications. Despite difficulties in this group of patients, there is a substantial benefit of using TRA. The Railway™ sheathless access system allowed us to keep our access and catheter profile 2 F smaller in comparison to a traditional 6-F sheath and 1.5 F smaller in comparison to a 5/6-F slender sheath, while still allowing us to use a 6-F guide catheter (Figure 8B). The low profile of the Railway™ access system very likely prevented spasm and pain despite tortuosity, small RA, and despite exchanging the guide catheter for multivessel intervention. The unique features of Railway™ allowed us to use guide catheters of our choice for performing PCI of the right and left coronary system. The smooth tapering transition of a wire/dilator/guide catheter assembly and hydrophilic coating on the Railway™ dilator prevented the razor effect of the guide catheter on the very tortuous anomalous RA. This is very similar to the effect achieved with balloon-assisted tracking. A 6-F guide catheter with a 6-F Railway™ dilator, a virtual 4-F system, very likely kept the C-A ratio < 1 and avoided trauma to the RA. The guide catheter exchange without any sheath using the 0.035-inch Railway™ dilator allowed us to perform multivessel intervention in a true sheathless procedure and maintained low-profile access throughout the procedure. We have been using a sheath for femoral and RA access for many years, and there are concerns that there will be bleeding around the guide catheter and the sheath is required to prevent this. But, in our first 25 cases with Railway™, we did not see any bleeding around the catheter (Figure 8C). The anatomic and physiologic changes in the artery, either with a sheath or catheter insertion, should be the same as long as the entry is atraumatic. The RA is the most muscular artery with high elasticity and grabs the catheter, except when it is very calcified. It lies directly against the bone, and it is therefore easy to apply gentle compression during catheter exchange. One of the concerns is that the torque transmission may be hampered in the absence of a sheath; however, even during conventional TRA, only the distal 5 to 10 cm of the distal RA is covered by a sheath while catheter torque is happening in the proximal 15 to 25 cm of the RA, similar to a sheathless approach. If catheter torque is causing any heat because of friction, it will do the same in traditional TRA in the proximal 15 to 25 cm of the RA. A C-A ratio < 1 should improve spasm, pain, trauma, thrombus formation, and RAO, which remains to be proven in forthcoming clinical trials. The Railway™ sheathless access system allowed us to perform transradial multivessel coronary intervention through a tortuous, anomalous, small-sized RA in an elderly, obese, female patient who had received her last dose of apixaban only 12 hours prior to the procedure. This case demonstrates that reducing the profile of the sheath (catheter)-to-artery ratio to < 1 and avoiding the bias or the razor effect of the guide catheter allow a successful TRA procedure in even the most difficult anatomy. Acknowledgement: I would like to thank Radika-Alicia Patel, Medical Student at New York University, for her assistance with the case report. 1. Andò G, Capodanno D. Radial versus femoral access in invasively managed patients with acute coronary syndrome: a systematic review and meta-analysis. Ann Intern Med. 2015;163:932-940. 2. Amin AP, Patterson M, House JA, et al. Costs associated with access site and same-day discharge among Medicare beneficiaries undergoing percutaneous coronary intervention: an evaluation of the current percutaneous coronary intervention care pathways in the United States. JACC Cardiovasc Interv. 2017;10:342-351. 3. Yoo BS, Yoon J, Ko JY, et. al. Anatomical consideration of the radial artery for transradial coronary procedures: arterial diameter, branching anomaly and vessel tortuosity. Int J Cardiol. 2005;101:421-427. 4. Kotowycz MA, Johnston KW, Ivanov J, et al. Predictors of radial artery size in patients undergoing cardiac catheterization: insights from the good radial artery size prediction (GRASP) study. Can J Cardiol. 2014;30:211-216. 5. Saito S, Ikei H, Hosokawa G, Tanaka S. Influence of the ratio between radial artery inner diameter and sheath outer diameter on radial artery flow after transradial coronary intervention. Cathet Cardiovasc Interv. 1999;46:173-178. 6. Nagai S, Abe S, Sato T, et al. Ultrasonic assessment of vascular complications in coronary angiography and angioplasty after transradial approach. Am J Cardiol. 1999;83:180-186. 7. Gwon HC, Doh JH, Choi JH, et al. A 5Fr catheter approach reduces patient discomfort during transradial coronary intervention compared with a 6fr approach: a prospective randomized study. J Interv Cardiol. 2006;19:141-147. 8. Abdelaal E, Brousseau-Provencher C, Montminy S, et al. Risk score, causes, and clinical impact of failure of transradial approach for percutaneous coronary interventions. JACC: Cardiovasc Interv. 2013;6:1129-1137. 9. Babunashvili A, Dundua D. Recanalization and reuse of early occluded radial artery within 6 days after previous transradial diagnostic procedure. Catheter Cardiovasc Interv. 2011;77:530-536. 10. Rashid M, Kwok CS, Pancholy SB, et al. Radial artery occlusion after transradial interventions: a systematic review and meta-analysis. J Am Heart Assoc. 2016;5. 11. Staniloae C, Mody KP, Sanghvi K, et al. Histopathologic changes of the radial artery wall secondary to transradial catheterization. Vasc Health Risk Manag. 2009;5:527-532. 12. Yonetsu T, Kakuta T, Lee T, et al. Assessment of acute injuries and chronic intimal thickening of the radial artery after transradial coronary intervention by optical coherence tomography. Eur Heart J. 2010;31:1608-1615. 13. Fraser D, Mamas MA. Transradial sheathless approach for PCI. Curr Cardiol Rep. 2015;17:47. 14. Velasco A, Ono C, Nugent K, et al. Ultrasonic evaluation of the radial artery diameter in a local population from Texas. J Invasive Cardiol. 2012;24:339-341. 15. Pancholy SB, Heck LA, Patel T. Forearm arterial anatomy and flow characteristics: a prospective observational study. J Invasive Cardiol. 2015;27:218-221. 16. Jolly SS, Yusuf S, Cairns J et al; for the RIVAL trial group. Radial versus femoral access for coronary angiography and intervention in patients with acute coronary syndromes (RIVAL): a randomised, parallel group, multicentre trial. Lancet. 2011;377:1409-1420. 17. Kwan TW, Cherukuri S, Huang Y, et al. Feasibility and safety of 7F sheathless guiding catheter during transradial coronary intervention. Catheter Cardiovasc Interv. 2012;80:274-280. 18. Batchelor W, Dahya V, McGee D et al. Ultrahigh-resolution ultrasound characterization of access site trauma and intimal hyperplasia following use of a 7F sheathless guide versus 6F sheath/guide combination for transradial artery PCI: results of the PRAGMATIC trial. Am Heart J. 2018;198:75-83. Disclosures: Consultation fees and royalty payment from Cordis, a Cardinal Health company.